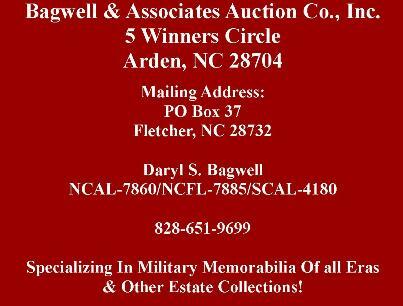 Bagwell & Associates Auction Company, Inc.
Special Announcement! As we Have Grown Over The Past Few Years, We felt The Need To Expand! Bagwell & Assoc. Auction Co. Has Moved To A New Location And We Are Excited! We Love Our New Office And Warehouse! PLEASE SCROLL DOWN TO SEE UPCOMING AUCTION DETAILS! THIS AUCTION WILL BE FEATURING: WW2 U.S. WOMEN'S CLOTHING-GERMAN/US BADGES-INSIGNIA-TOTENKOPF CUFF TITLE-EARLY 1ST PRODUCTION SA DAGGER BY EICKHORN- + MUCH MORE! IMPORTANT NOTE:-- "ANY AND ALL ITEMS OFFERED FOR AUCTION IN THE FOLLOWING CATALOG, AND THAT ARE ASSOCIATED TO THE THIRD REICH, ARE OFFERED AS HISTORICAL ARTIFACTS THAT WERE CAPTURED BY WW2 ALLIED SOLDIERS AND BROUGHT BACK AS VICTORY SOUVENIRS. THESE SOLDIERS RISKED THEIR LIVES AND SPILLED THEIR BLOOD FIGHTING FOR THE FREEDOM OF THE FREE WORLD! THERE IS ABSOLUTELY NO INTENT TO PROMOTE ANY IDEOLOGY OF THE THIRD REICH, FASCISM OR SOCIALISM. 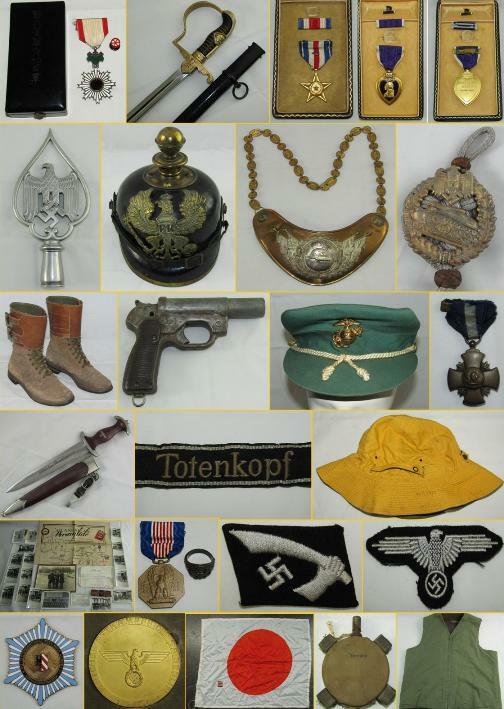 IF ANYONE FEELS THAT THESE HISTORICAL ITEMS RELATED TO THE THIRD REICH ARE OFFENSIVE, PLEASE DO NOT OPEN CATALOG LINKS , AS THEY SHOW DETAILED PHOTOS OF THESE ITEMS"
Items offered are direct estate acquired items and/or select consignments from private collections. PREVIEW AND EARLY REGISTRATION: ONLINE CATALOG PREVIEW ONLY FOR PRE BIDDING AND ONLINE INTERACTION AUCTION REGISTRATION. CLICK HERE TO VIEW OUR ONLINE AUCTION CATALOG AND REGISTER TO PRE-BID OR BID ONLINE LIVE!!! ALL LOTS SHOW DETAILED PHOTOS AND DESCRIPTIONS. WE MAKE EVERY ATTEMPT TO QUALIFY AND DESCRIBE EACH ITEM AS THOROUGHLY AS POSSIBLE. WE WILL NOTE AS ACCURATELY AS POSSIBLE, ANY VARIATIONS AND/OR CONDITIONS OF ITEMS OFFERED FOR AUCTION. PLEASE BID BASED ON YOUR OWN KNOWLEDGE AND EXPERTISE. GOOD LUCK AND HAPPY SUCCESSFUL BIDDING! You Don’t Want To Miss This Auction If You are a collector of Military memorabilia!! CLICK THIS LINK TO VIEW OUR MORE RECENT ARCHIVED AUCTIONS AND RESULTS! BAGWELL & ASSOC. AUCTION CO. IS PLEASED TO ANNOUNCE THAT WE NOW HAVE OUR FEDERAL FIREARMS LICENSE AND ARE NOW ACCEPTING CONSIGNMENTS FOR UPCOMING FIREARMS AUCTIONS. Please Note: If you are an out of state winning bidder on any regulated firearm.The credit card you have on file will charged within the next 24 hours for the winning bid. Shipping will be charged seperately and an email will be sent with tracking info. If you have an FFL and/or C&R license, please email your copy to bagwellauctionsco@gmail.com. If you do not have an FFL or C&R license, please send a copy of the nearest FFL dealer in your area that you would like you item(s) shipped to.Any and all firearms that are sent to another registered FFL dealer that do NOT pass a Federal background check may NOT be returned for credit...If Any of the items you purchased do not require an FFL and/or C&R license, then no other action is required. Terms: Master Card/ Visa. Buyer’s premium of and 18% for ALL internet bidders. NC sales tax will apply on all sales within the state of NC unless a valid tax exempt # is provided. All purchases must be paid for on the day of sale. ALL SALES ARE FINAL. No returns or refunds. ALL ITEMS SOLD AS IS WHERE IS with no guarantees. Announcements made at the beginning of the sale override any previous announcements. Directions: From Asheville take I-26 East towards Hendersonville. Take the Airport Rd. exit then left on 280.Go straight at intersection of Hwy. 25 and 280 which begins Hwy 25A (Sweeten Creek). Winners Circle will be on the left just past Allied Van Lines. After turning onto Winners Circle,Bagwell Auctions is on the right at bottom of hill just past Delong. From Hendersonville and/or the south, follow I26 West to Airport exit and follw previous direction. Bagwell Auctions is on the right at bottom of hill just past Delong.